Some of these are really great. I really liked the ones for Waiting for Dani, Neverland, and Van Rosenberg - all great stories. I know it's unfinished but have you thought about one for The Apothecary by Tara the Phoenix, or did I miss it? Several of the avatars are quite fun as well. And ALL of your links work! Rachface: I'm glad you noticed the new pics of Aly and Amber. One of the challenges is finding two photos that compliment each other; I had to search a while before I found those two. Sammy: Thanks! I hope it did Neverland justice! Owl: Thanks for checking it out. Neverland does the same thing to me when I read it. Easiersaid: It was totally my pleasure. Thanks for sharing this story with all of us! Vampyregurl73: Thanks for checking out this thread. I did have an idea way back for the Apothecary, but it's been so long, I'd have to re-read the story again. Which is not a bad thing, because it's so good. Foomatic - WOW! What an amazing and beautiful wallpaper for Neverland. I love it and it really captures the story! Great work, thanks for sharing with us! I love the mature style. Foovatars rock! Seriously, I watched them all, and I'm just like: I wish they could be mine... I really liked the one you did on Neverland. What with the Golden Gate bridge and the Fillmore sign. I always wonder where you get so many different Aly/Amber pictures. Must be a lot of work. Pipsberg: Thanks for the feedback. I do love me some Neverland! nimloth: Hey Vi! I certainly do feel like my style has matured! Thanks for popping in! Mrs. Pineapple: I live in the San Francisco suburbs, so I felt it was my duty to do a Neverland wallpaper. I've told Heather so, but everytime I'm in the city I have expect to see the two of them rounding a corner, heh. Thanks! Miss Elly: I don't know how I do it either. They just sometimes take on a life of their own. I'm glad you liked the wallpaper! darkwillow83: Snag away! Hopefully I'll come up with more someday! So my creative juices got flowing again the other day, and I was itching to create another DCP fic inspired wallpaper. 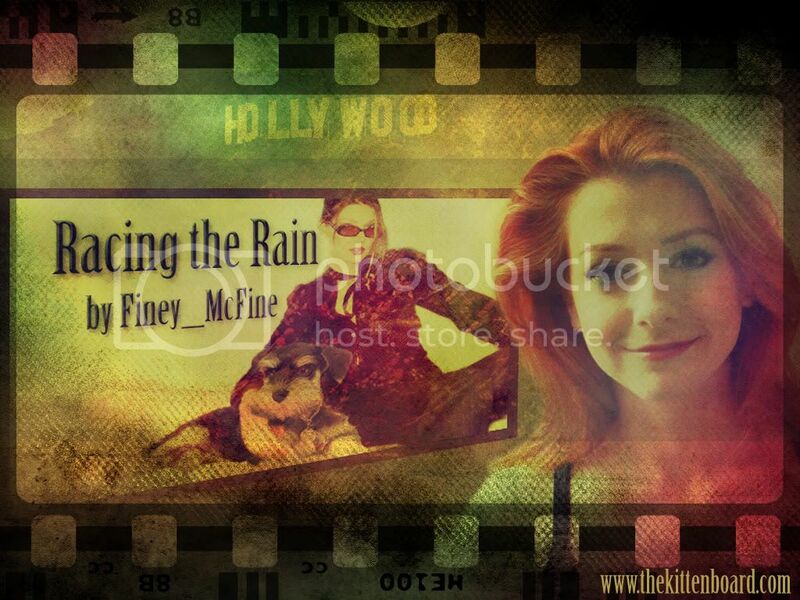 This offering is an homage to Racing the Rain, currently burning up the DCP forum. Enjoy! Foo, Racing in the Rain is one of my fav fics and the wallpaper you created for it is really, really beautiful!! Great job! Thanks so much for the wallpaper...I LOVE it!!!! It was on my desktop and my Twitter pg. about 30 seconds after I read your PM! Seriously, I'm honored to have my fic amongst the Foo wallpaper elite! BTW...I may have to hire you for some freelance graphic design! I like your work!! The wallpaper you did for Racing the Rain is incredible! You are an amazingly talented lady! Wow go missing for a few years, and come back to find Foo has become an amazing artist. These are truly beautiful.